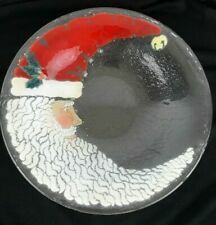 Peggy Karr fused glass bowl, large size. popular pattern. For Your Consideration is this Beautiful Bowl from Peggy Karr. Bowl is from the Peggy Karr Glass Studio in Morristown, New Jersey, which closed it's doors in 2016. Bowl is signed "PKG 03" on the lower right front rim of bowl (all Peggy Karr pieces are signed, usually in the 4-o'clock to 5-o'clock area of piece). For your consideration is a 2" high by 13 1/4" wide Peggy Karr serving ball, depicting two large apples and signed as shown on the last two photos. You will never be disappointed. Artist Peggy Karr. Crescent Santa Face. Round Bowl. It has a beach scene with a hut & palm trees as well as sand and blue sky. 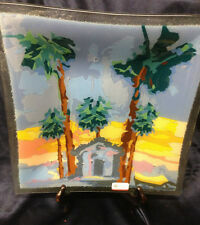 PEGGY KARR FUSED GLASS SQUARE PLATE. There are minor scratches on the front. For Your Consideration is this Beautiful Bowl from Peggy Karr. Bowl is from the Peggy Karr Glass Studio in Morristown, New Jersey, which closed it's doors in 2016. Bowl is signed "PKG 02" on the lower right front rim of plate (all Peggy Karr pieces are signed in the 4-o'clock to 5-o'clock area of piece). 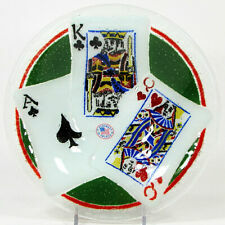 Peggy Karr Art Glass Plate Vtg Red Hot Chili Peppers Signed 2001 Round 8 1/2"
It is signed "PKG '01". There are bubbles in the glass as expected with a hand crafted item. Bowl is signed "PKarr dcj" (Peggy Karr & Diane C. Johnston) on the lower right front near the apple/pear (all Peggy Karr pieces are signed). For Your Consideration is this Beautiful Bowl from Peggy Karr. 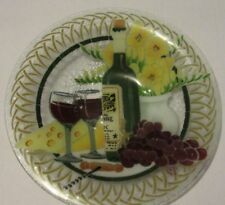 Peggy Karr Bowl Wine Cheese Grapes Flowers Made USA 13 1/4"
Peggy Karr Bowl. Initialed PKG for Peggy Karr Glass. Pattern - Wine Cheese Grapes Flowers. No damage or repair. Shipped with USPS Priority Mail. 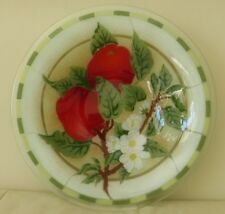 PEGGY KARR FUSED GLASS 8 1/4" PANSIES BOWL MINT! BUY IT NOW! PEGGY KARR TROPICAL FISH FUSED GLASS ROUND BOWL. 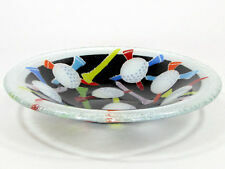 This is a beautiful Peggy Karr Tropical Fish Fused Glass Round Bowl. MULTI-COLORED TROPICAL FISH. It is in multi-colored fish design - blue, yellow, red, aqua, white on clear background.